Soft pastels are essentially made using dry pigments (for colour) and a filler (ground clay, talcum powder, etc. for the white), to which is added a binder that allows the pigments to hold together as a stick. 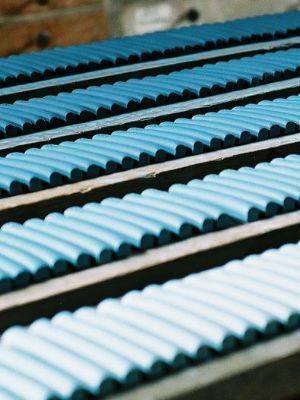 The Roché pastels recipes and process of manufacture allow a minimum amount of binder, which leaves the pigments all their brightness. The first step in the manufacture process consists in establishing the pigment mix that will generate the desired colour. These pigments are then mixed together with the binder and water in order to obtain a smooth paste that can then be ground. In the past, the paste was ground manually using a stone grinder. Today, this technique is only used for small quantities of paste. For larger amounts, the grinding is mechanical. The same procedure applies to the white that will be used in the gradation: each colour range is composed of 9 different grades, the first grade being "pure" colour, and the 9th grade the lightest, that is composed essentially of white. The coloured paste and the white are mixed together in different proportions in order to obtain the nine grades in each colour range. These nine pastes are set to settle on tiles. Each "tile" is then treated separately. The paste is placed in a towel. The cloth is then placed under a press in order to eliminate the excess water in the paste, and obtain a consistency similar to that of modelling clay. Small balls of that paste are then weighed, and hand-rolled into thin sticks that are placed alongside one another on a wooden plank. The last step consists in cutting off the end of the sticks to give them the proper length and shape, and adding the "ROC" stamp which is the mark of Roché pastels. The pastels are then left to air-dry. already registered at CaillouBaton ?